Barbadians are being asked to help locate missing girl Melina Naomi Leblanc, 14 years of Sargeant’s Village, Christ Church. 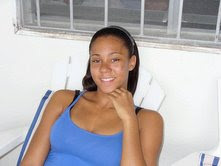 She was last seen at Sargeant’s Village, Christ Church on the 10th April 2007. Melina is 5?5? in height, slim build with wide shoulders, light brown complexion, long black straight hair, thin eyebrows, high forehead, round head, has a pleasant manner and an erect appearance. Her clothing is unknown. Any person who may have knowledge of Melina?s whereabouts is asked to contact the Worthing Police Station at telephone number 430-7615, Operations Control at 211, Crime Stoppers at 429-8787 or the nearest Police Station.